A crowd of musicians fills Room 124 for a practice session of Johann Strauss, Jr.’s The Blue Danube. Instruments chirp in anticipation as the waltz’s first notes resonate from the piano. Pigtails bob and sparkly sneakers keep time as over two dozen 4th-graders play along using recorders. “Place your fingers in the bunny-ear position for this part,” advises Amanda Lattin, Seahurst Elementary School music teacher. “I like it because we actually get to play an instrument and I know the more I practice, the better I’ll get,” says Julysa Rosales Cervantes, age 10. Seahurst, in the Highline School District, is one of 107 schools from Marysville to Olympia participating in the Seattle Symphony’s Link Up program. New York’s Carnegie Hall Weill Music Institute developed and provides the curriculum, teacher guides and student workbooks at no cost to 80 partner orchestras around the world. The hands-on programming includes singing, playing recorders and additional music instruction for grades 3–5. For Puget Sound students, the experience culminates in a field trip to Benaroya Hall when students perform from their seats along with the Symphony. Since becoming a Link Up national partner during the 2012–2013 season, the Symphony has welcomed over 27,000 students to join the orchestra for an afternoon of playing music. “We wanted to offer more than having school groups bus to the hall and listen passively without much preparation. 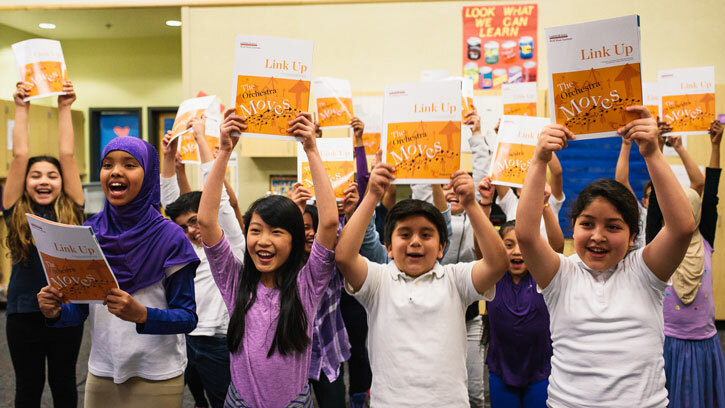 Link Up engages students on so many more levels,” says Laura Reynolds, Seattle Symphony’s Director of Education & Community Engagement. Link Up augments existing music programs and fills gaps for schools without music funding. Teachers either incorporate the curriculum on their own or host 5- or 10-week residencies whereby Symphony Teaching Artists visit classrooms. Weekly sessions average 45–60 minutes. A 20-week option is being piloted this season. Currently, 21 schools host residencies. “Having professional musicians visit brings community connections and real-world applications that kids might not otherwise experience,” says Samantha Bosch, one of a dozen Teaching Artists. Nicknamed Ms. Sam, kids look forward to her “Mystery Instrument of the Week” — a show-and-tell of anything from trumpets to piccolos. She currently teaches Link Up at Seattle’s Broadview-Thomson School and the New Futures after-school program, which works with underserved youth in South Seattle and Highline School District. “I have kids from all different cultural and language backgrounds as well as learning abilities and Link Up really builds bonds,” says Bosch. As of 2015, Highline School District adopted Link Up districtwide for all 4th-graders at 18 elementary schools. Part of Link Up’s appeal is that students are allowed to keep their recorders. Washington nonprofit Music4Life helps provide for Highline students who cannot afford their own. The program also caught the attention of country-pop superstar Taylor Swift who donated $50,000 to the Symphony with half allocated to Link Up. Donations make a huge difference in making Link Up available to young people who might not otherwise experience it. Nearly 70% of Highline School District students qualify for free or reduced lunch. In addition to music skills and appreciation, students hone listening ability, collaboration, discipline and perseverance, which positively impacts their general studies. “It transcends music. It’s applicable to schoolwork, college, career and all future endeavors because it develops vital 21st century skills,” says Pamela Ivezic, Seattle School District Instructional Services Music Coach. In Lattin’s class at Seahurst, normally reticent students find their voices both literally and figuratively. They are so excited to participate, that they enthusiastically sing, help one another and hands shoot into the air to answer questions. The class collectively decided they are not yet ready to take their recorders home to practice. They will let Lattin know when they are. Lattin’s class will attend and perform at Seattle Symphony’s May 19 Link Up event. “I love this song!” a young voice exclaims as the class practices. The children stare intently as Lattin demonstrates a particularly challenging part. They master it after a few tries. Thank you to each and every supporter of the Seattle Symphony. Your gifts help make Link Up a reality! To support Link Up, you can make a gift online or call Donor Relations at 206.215.4832. Every gift makes a difference! Deanna Duff is an award-winning freelance writer, supporter of the arts and lifelong Seattle Symphony enthusiast.